This is a square Auntie Chatter Motor Oil porcelain sign. This particular Auntie Chatter Motor Oil sign is predominantly navy with a yellow center and white text. 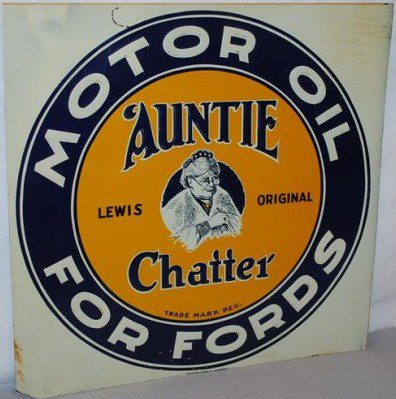 It reads, “Auntie Chatter Motor Oil For Fords, Lewis Original, Trade Mark Reg.” and features an elderly woman wearing a shawl in the center.